The Secrets of Umoja is a theme based children’s coloring book that focuses on everyday relationships that create unity. 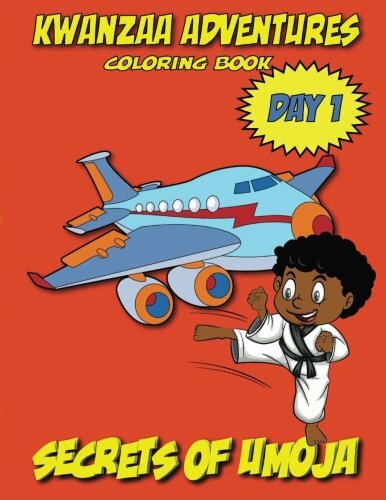 The Kwanzaa Adventures Coloring Book series, is a great year round coloring book that creatively introduces children to the concepts behind the Kwanzaa Celebration within the African American community. There are seven books, and each one represents one of the seven Kwanzaa principles. For African American children, these coloring books intuitively reinforce the rewards and benefits of civic duty and responsibility. The Bold images and Creative captions were designed to capture the imagination of black kids, and inspire a sense of pride, as well as, nurture a child’s creative abilities through the use of colors. Kwanzaa Adventures Coloring Books are one of the best opportunities for quality engagement between parent and child. All Black Children’s Coloring Books feature 33+ single sided image scene pages.